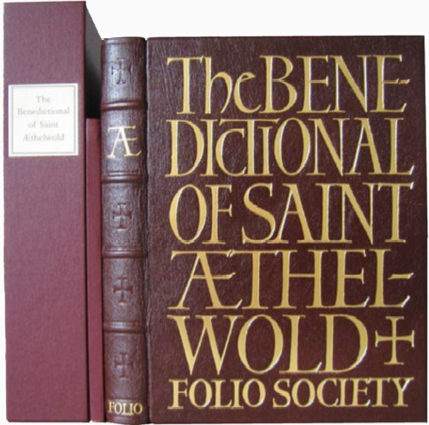 The current Folio Society Limited Editions program started in 2001 with "The Benedictional of St Aethelwold". 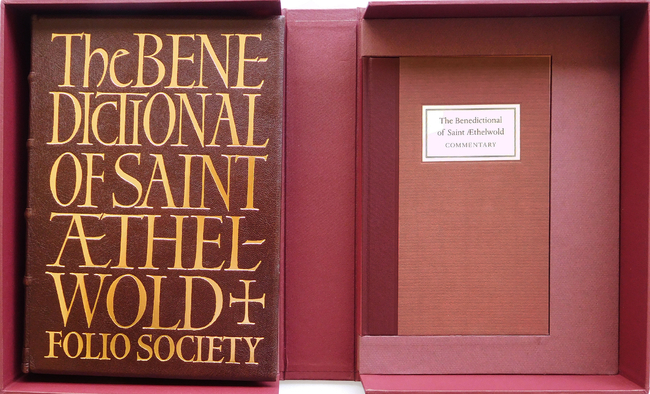 Since then, the FS has produced 84 superb LEs, plus the 39 Letterpress Shakespeare volumes, to the end of 2017. 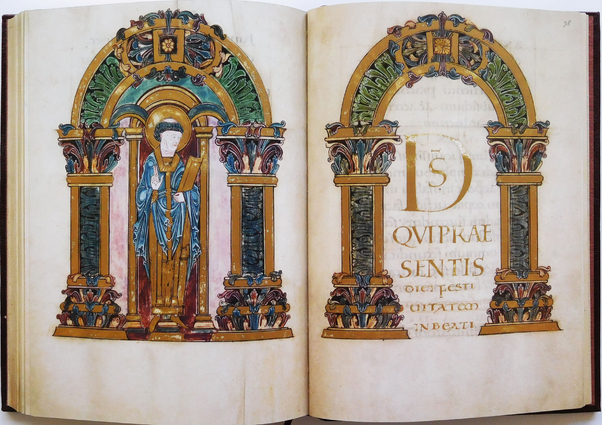 St Aethelwold is a magnificent facsimile of an illuminated manuscript that was produced between 960 and 975AD. 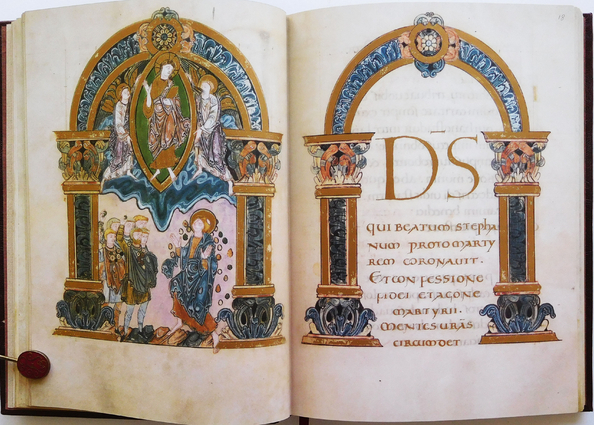 It is the most lavishly illustrated manuscript known from Anglo-Saxon England. It is not only a great work of art, it is also a notable literary ahievement. 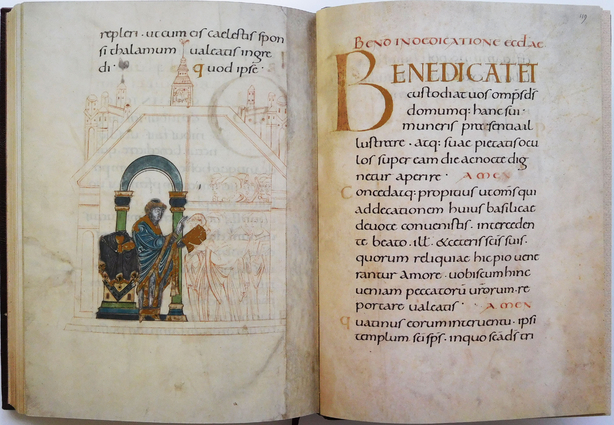 It was probably executed in Winchester by a monk known as Godeman, and is a collection of blessings suitable for different ocassions. 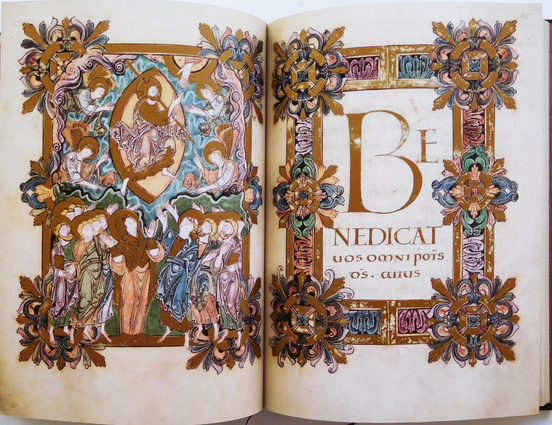 The facsimile is extraordinarily faithful to the original, reproducing tears, show-throughs and watermarks, as well as the gilded illustrations and intricate calligraphy of the Latin text. 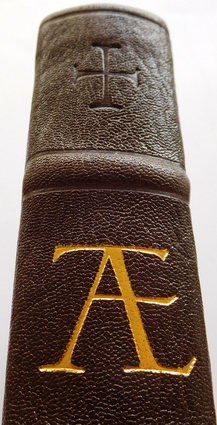 The facsimile volume is bound in brown goatskin leather blocked with the title in gold, with four raised spine bands, and additional spine embossing. 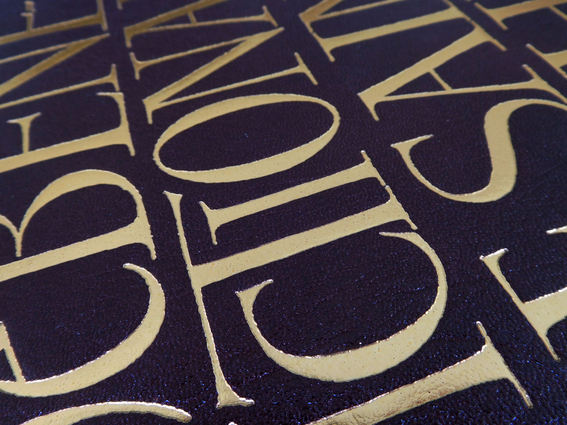 The paper is very thick Phoenix Motion Xenon that mimics the original lambskin vellum. 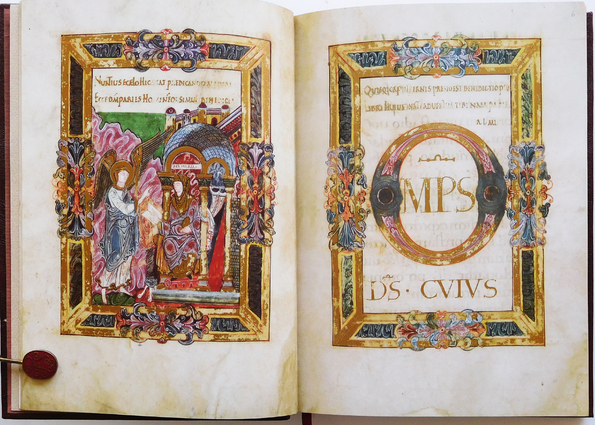 The facsimile volume has 240 pages and is 28.5x21.5cm. 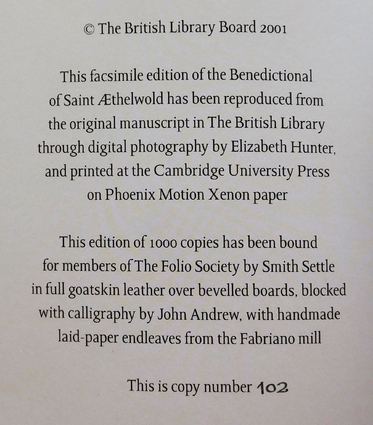 The endpapers are handmade laid-paper from the Fabriano mill. 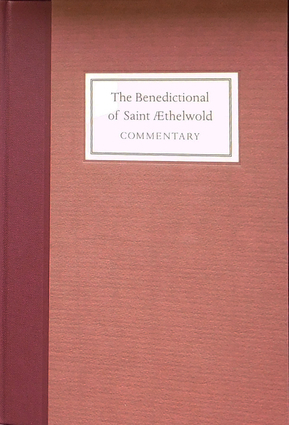 There is an accompanying 41 page, unillustrated, Commentry volume that is quarter bound in maroon buckram with handmade paper sides. It is 22.5x15.5cm. 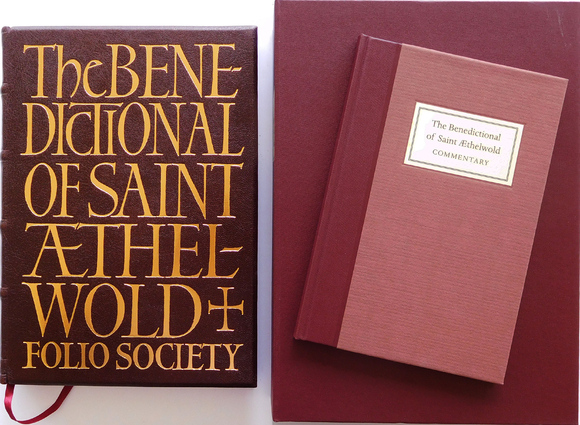 Both volumes are housed in a plain maroon Solander box 31.2x23x6cm. that has a paper label on the spine. 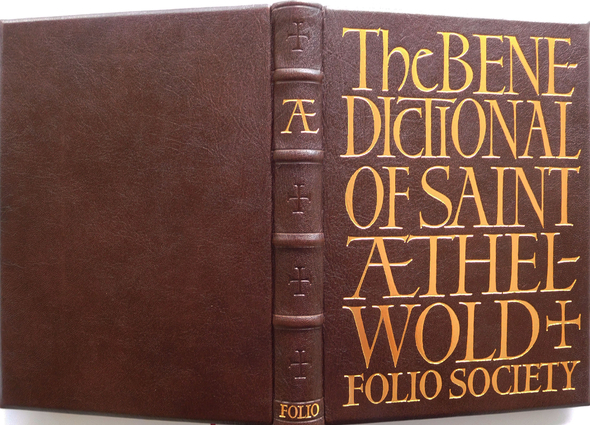 A beautiful book to peruse, fondle, smell and savour. It’s beautiful! I’m curious - when you say it faithfully reproduces tears etc in the original, do you mean the pages in the facsimile are actually torn? Or is it just an artistic effect? 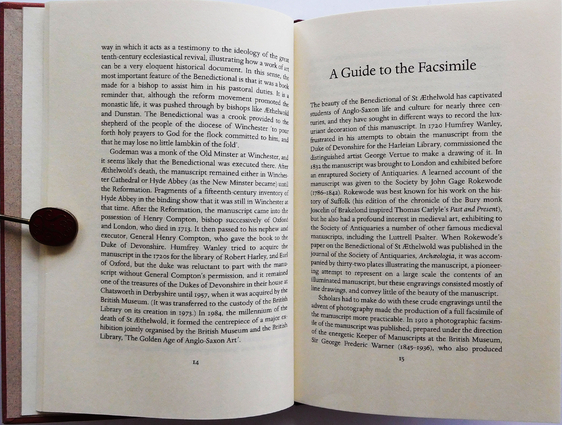 The pages were digitally photographed and printed on thick paper to imitate the thickness and feel of the original substrate, which is the usual practice whenever creating facsimiles of premodern documents. The tears and missing page corners are just an artistic effect, unlike the Van Gogh Notebooks facsimile LE, where the pages were actually cut and torn to match the original. >4 scholasticus:, >5 wcarter: thanks! I had remembered reading about the binders tearing the LE van Gogh pages by hand - an amazing commitment to detail - which was indeed why I was curious. The van Gogh is probably the only facsimile I have heard of where this was done - does anyone know of others? 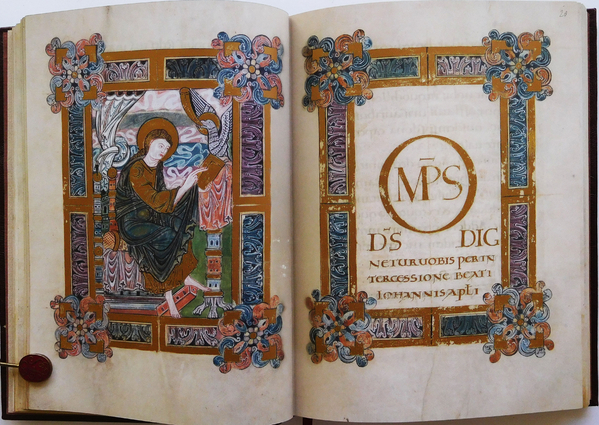 It's standard practice in high-end facsimiles of medieval manuscripts. Little ellipses where the original sheepskin had worm holes before processing for parchment, or nicks during scraping, are very common. Thank you for your hard work on this series. This one is definitely on my list to acquire, it is splendid. 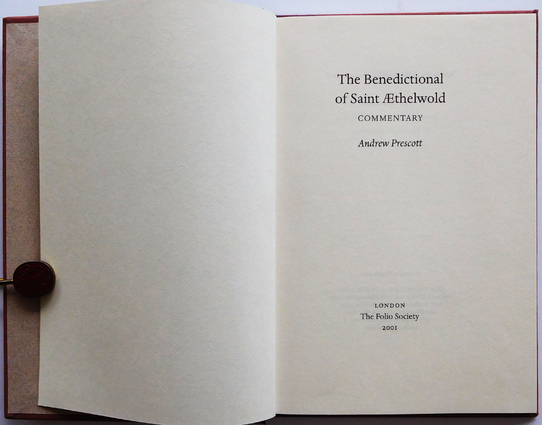 I am not sure if this indicates a difference in different copies of the Benedictional, but mine has 240 pages. 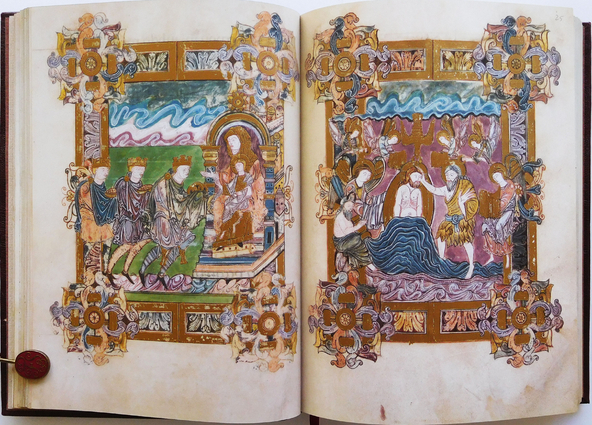 And some of the pages from 111 to the end show a trait that a rare book librarian pointed out to me when I showed it to her: they have bits of text in the inner margin, showing that those pages were actually pulled from another manuscript. but now I see that you have an illustration of pages 238 and 239, so I guess you just mistyped. You are correct, edited in original post to show correct page count.